Today’s photo hearkens from the disco era of big sedans and colorful graphic designs. 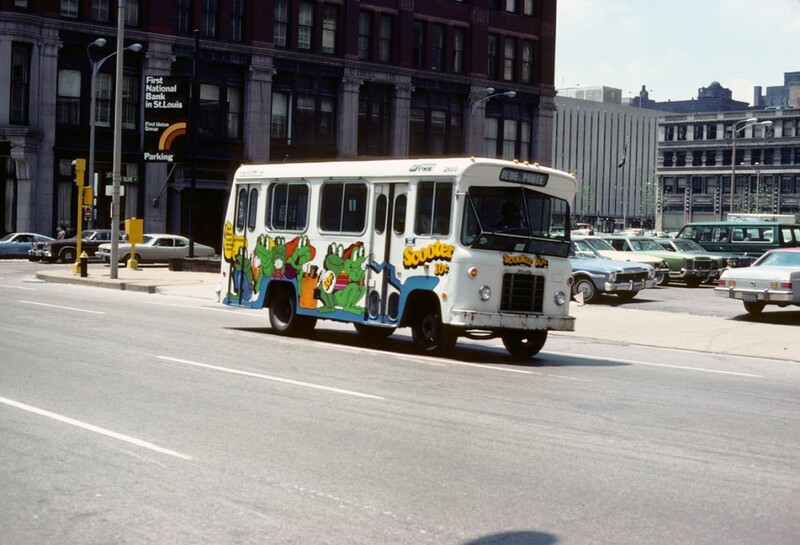 Both are evident here as a downtown “Scooter” bus scoots along Olive Street near 4th Street in May of 1978. Speaking of disco, the number one hit song during the month this photo was taken was “Night Fever” by the Bee Gees. Have a far out weekend! Holy cats! It’s Olive and 4th. The building just behind the “scooter” bus is the Hilton hotel. One Metropolitan Square is not there yet. Also missing is St. Louis Place, begun in 1983. This photo is from 1982. Olive Street near 4th Street in May of 1978. 4th and Olive, looking southwest… (which I deduced, but also can confirm from the street signs), and I guess sometime between 1975 and 1985, considering Met Square isn’t built. Let’s say… 1979. Yep! Olive Street near 4th Street in May of 1978.